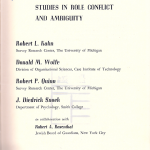 Robert L. Kahn, research scientist in the Institute for Social Research, professor emeritus of psychology, and professor emeritus of health services management and policy, retired from active faculty status on June 30, 1988. Professor Kahn received his B.A. degree in 1939, his M.A. degree in 1940, and his Ph.D. degree in 1952, all from the University of Michigan. He received an honorary Ph.D. degree in social science from the University of Amsterdam. His contributions to the University of Michigan were recognized with the Distinguished Faculty Achievement Award in 1985. After joining the Institute for Social Research as a study director in 1948, Professor Kahn remained at the University of Michigan for 40 years. 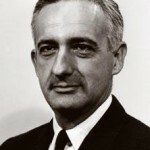 He was promoted to assistant program director in 1951, program director in 1952, and research coordinator in 1961. 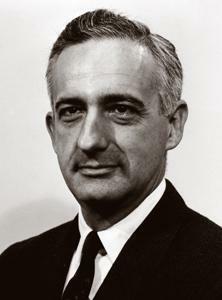 He served as acting director of the Survey Research Center in 1968-69, and as its director from 1970-76. In 1948, he was appointed lecturer in the Department of Psychology; he was promoted to associate professor in 1954 and professor in 1960. He was appointed professor in the Department of Medical Care Organization, now the Department of Health Services Management and Policy, in 1980. Professor Kahn is internationally renowned for his research on organizations and as a survey research methodologist. 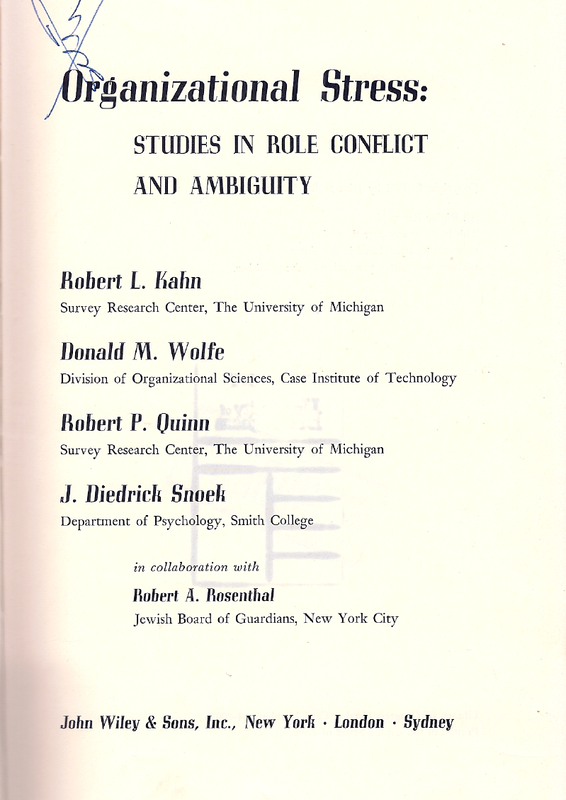 His Social Psychology of Organizations (co-authored with Dan Katz), first published in 1966, redefined the field of organizational psychology and inspired much research by other investigators. His own empirical research on organizations is reported in several other books, including Organizational Stress, Bureaucratic Encounters, The Study of Organizations, and Work and Health. Professor Kahn is co-author (with Charles Cannell) of The Dynamics of Interviewing, a volume recognized as a classic in the field of survey research interviewing. He is also co-author (with Robert Groves) of Surveys by Telephone, the first major book on telephone interviewing. Professor Kahn’s wisdom and broad expertise in the social sciences led to his repeatedly being asked to serve in leadership roles. He was elected president of the Society for the Psychological Study of Social Issues and to the Council of Representatives of the American Psychological Association. He has also served the National Academy of Sciences, the President’s Commission on Mental Health, the Social Science Research Council, and the MacArthur Foundation, and has been on the editorial board of a number of journals. 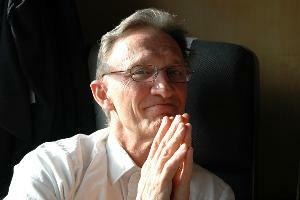 Lennart LeviLennart Levi, MD, PhD, Emeritus Professor of Psychosocial Medicine. Became Sweden’s first Professor of Psychosocial Medicine at the Karolinska Institute in Stockholm, Sweden, in 1978. In 1959 he founded and chaired the Karolinska’s Department of Stress Research, which in 1973 was designated the first World Health Organization Centre in this field. 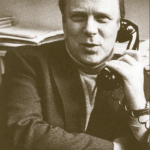 In 1980, he also founded and directed the National Swedish Institute for Psychosocial Factors and Health (IPM). During 1982-2005 he has been Chair of the Section on Occupational Psychiatry of the World Psychiatric Association and, since 2001, President of the International Stress Management Association. Before and after his retirement in 1995, he has been an advisor to WHO, ILO and the European Commission in his field. During the period 2006-2010, Lennart Levi was Member of the Swedish Parliament and Spokesman for Public and Occupational Health issues of the Center Party. As from October 1, 2007, the research of IPM is part of the Faculty of Social Sciences at Stockholm University. At www.stressforskning.su.se, read about today´s activities, research and publications of IPM and the Stress Research Institute. 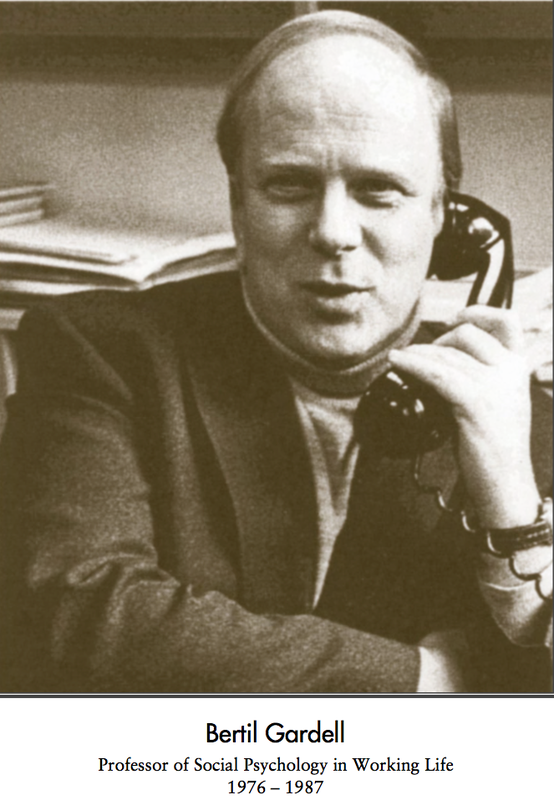 Bertil Gardell (1927-1987), était un professeur de psychologie sociale à l’Université de Stockholm. Bertil Gardell a fait son doctorat sur « Technique de production et satisfaction au travail. Une étude socio-psychologique du travail industriel » en 1971, qui a inauguré une série de projets et d’études sur l’organisation du travail et de la technologie, en particulier en ce qui concerne l’implication, l’autonomie et la santé et la sécurité des travailleurs. Un autre thème majeur dans sa recherche était de voir dans quelle mesure l’ influence et le contrôle exercés par l’homme dans son travail (la latitude décisionnelle) étaient liés au stress et à la santé. Il a travaillé sur ces questions avec la chercheuse spécialisée sur le stress, la Prof. Marianne Frankenhaeuser. Les travaux de Gardell et du sociologue Dahlström ont joué un rôle important dans le débat qui a précédé la législation suédoise très innovante dans les années 1970. 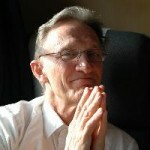 Robert Karasek, sociologue, est Professeur à l’Université du Massachusetts Lowell (Department of Work Environment) et à celle de Copenhague (Department of Psychology). Il est détenteur d’un doctorat en sociologie et en relations de travail, de même que de Masters en architecture et en génie civil.Il dirige une équipe de recherche qui a notamment élaboré le « Job Content Questionnaire », à la base du modèle dit « DCS » (Demand-Control-Support), dont il est co-auteur avec Töres Theorell. Ce modèle est une des références majeures en matière d’analyse des liens entre travail et santé.Robert Karasek est en lien avec un vaste réseau de chercheurs internationaux, avec qui il collabore dans le but notamment d’élaborer une nouvelle version du « Job Content Questionnaire ». What have been the main academic issues your team has worked on in the past? “Our team has worked for several years on what aspects of modern work and employment conditions are important for health. In the past, occupational medicine mainly focused on physical and chemical noxious stimuli at work, and issues like working in shifts and the effects of noise. Today there are many other challenges such as technological progress, the increase of the service sector (and therefore service sector occupations), rising competition due to globalisation of work and employment, and also increasing job insecurity. We have analysed the adverse effects of these aspects of modern work on the health of employees, in particular focusing on the socially unequal distribution of these aspects amongst the working population. Is there already some evidence of the impact of increased competition in the globalised world on health? “Yes, there is. In order to identify those components within the complex work environment that really matter for health, you first need to develop a theoretical model that will allow you to analyse such associations. Our research resulted in the “effort–reward imbalance model” (Siegrist, 1996). The idea behind this model is that in modern economies workers are often forced to put a lot of effort into their job and to work in highly competitive environments. The compensation for these efforts is, however, not always adequate and proportionate. Not only in terms of salaries but also in terms of job security, promotion prospects, and the credit and recognition given by supervisors. Are there, besides the “effort–reward imbalance model” that you have developed, any other models being used to study the effects of the workplace on employee health? “Yes, there are two other theoretical approaches that have been developed to analyse health adverse consequences in modern work, in which the physical and chemical hazards are not in the first line of analysis – even though they are still important. The first approach, which is the oldest and best known, is the so-called “demand–control model”, developed by the American sociologist Robert Karasek (1979) and the Swedish epidemiologist Töres Theorell (Karasek & Theorell, 1990). The model defines work-stress in terms of specific task profiles, which are characterised by high demands and pressure, and low control and decision latitude. The “demand–control model” therefore analyses the health of workers in a different way but has health consequences similar to those described earlier. Therefore the health risk is cumulative for those people working under conditions that characterised by both the demand–control and effort–reward imbalance models. When exposed to multiple stressors, workers thus experience an additional burden on their health. How do health inequalities fit into all of this and why are they important? “Adverse psychosocial work environments are unequally distributed across the working population, leaving those at the lower end of society at higher risk of suffering from adverse health effects as a result of their working conditions. Lower-skilled people are more likely to have a job which has high demands and low control, and where rewards are relatively poor compared to efforts exerted. The prevalence of some major chronic diseases also exhibits a social gradient. For example, cardio-vascular diseases are more common amongst lower-educated and lower-status people than amongst managers and higher-skilled employees. Depression occurs twice as often amongst lower-skilled blue-collar workers as amongst higher-skilled white-collar workers, and manual labour is typically associated with a higher risk of work-related accidents. There are of course other factors – such as unhealthy behaviours – that also have an impact on the prevalence of diseases and risks at work, but it is a fact that a social gradient exists and that certain diseases affect those in lower socio-economic positions more frequently. The following three relationships have been scientifically proven: (1) a low socio-economic position is related to a high health risk; (2) a low socio-economic position is related to a high frequency of stressful psychosocial work; and (3) stressful work is related to a high health risk. A first approach addressing links between employment and health and explaining the social gradient is called the “mediation hypothesis”. This combines these three associations and states that stress at work mediates (at least partially) the statistical relationship between a low socio-economic position and a high health risk (such as coronary heart disease or depression). The second approach is called the “moderation hypothesis”, which is built around the idea that stressful or unhealthy work has an impact on the health of employees at all levels. The strength of the effect, however, varies. People at the bottom of the social hierarchy experience a stronger effect of workplace stress on their health compared to people from higher up the social hierarchy. The explanation given by the “moderation hypothesis” for this phenomenon is that people living in more privileged situations have better resources available and are therefore better able to cope with adverse work environments. So how does the DRIVERS project enrich your work and research? “Firstly, as part of DRIVERS we will be performing systematic reviews to collect and bring together all current evidence on the links between working conditions, social inequalities and unequal health. This adds a new component to our work, as until now we have only been involved in original research rather than systematic reviews. In addition to that, DRIVERS provides us with the important opportunity of working together with EuroHealthNet to increase the dissemination of available research, especially among policy makers. Awareness amongst policy makers on the links between employment conditions, health and the social gradient is often limited. However, intensive dissemination of existing knowledge can’t be done by a university alone, and European or international initiatives (such as the WHO European Review on Social Inequalities in Health) therefore offer great opportunities to bridge the gap between researchers and decision makers. How does collaboration between the three DRIVERS research components contribute to more comprehensive scientific approaches to analysing health inequalities? “Until now our research has mainly focused on the working conditions of individual workers and companies. This type of research is – of course – contextualised by macro-level conditions like laws and labour market policies, and also by transnational economic developments such as budgetary cuts as a result of the economic crisis. DRIVERS provides us with the opportunity of broadening the research framework we work within and moving away from concentrating on single companies or single employees to analyse the broader social context. For example, it will be interesting to collaborate with the DRIVERS work strand on Income and Social Protection work, which is led by Professor Olle Lundberg from the Centre for Health Equity Studies in Sweden (CHESS). He has been studying welfare regimes and social security arrangements in cross-national comparative settings, and through this collaboration we will be able to further reinforce and expand the multi-level approach our team is taking. Finally, if there were one outcome that you could ideally achieve by the end of the DRIVERS project, what would it be?